For other places with the same name, see Jasper (disambiguation). Jasper  is a town in Jasper National Park in the Alberta Rockies region of Alberta, Canada. Located in the eastern slope of the Rocky Mountains, Jasper is the shy cousin to bold, brassy Banff and offers a more serene experience. Approximately four hours north of Banff and four hours west of Edmonton, capital of the province of Alberta. Most people enter the park via Edmonton. It can be reached by road or train. Highway 16, the Yellowhead Highway, connects Jasper to Edmonton, which has an international airport and is served by many major airlines. Highway 93, the Icefields Parkway, connects south through the Rockies to Lake Louise and onto Banff. Drivers will have to pay for a park admission pass as the town of Jasper is located within Jasper National Park. There are bus and train connections from Edmonton, Banff and Vancouver. Those driving to the park should be aware that a park fee of $20 per night applies. Annual passes are available for $89. There is no public transit. A few taxis and rental cars are available, and bikes can be rented in the summer. Hitchhikers report that getting a lift in Jasper is very easy. Jasper is small enough that most places can be easily walked to. Tour companies offer bus service to most of the major tourist destination including Maligne Lake, The Columbia Icefields and Miette Hot Springs. The two major companies in town are Brewster and SunDog. Both these companies offer similar tours at the same price. The only difference is the size of the tour group: Brewster uses large buses (seating approx. 50) and SunDog has smaller vehicles (seating approx. 12). Maligne Lake, which has regular boat trips to see the wonder of a lake with water two different colours in different parts. Spirit Island, made famous by a photography competition, is in the middle of Maligne Lake. The most common way to see it is to take the boat cruise (1.5 hours round trip). You can also rent canoes and kayaks, and, if you are prepared to camp at the other end of the lake, paddle the 8+ hours it takes to get there. Angel Glacier, take highway 93A to Mount Edith Cavell and take the 500m hike from the parking lot to view Angel glacier and its lake full of icebergs. A longer 5km trail (500m up) is also available for even better views. Note for 2017 a pass is required (line up at the Jasper into center to obtain for free, from 8-10am daily). The pass is required due to the continuing reconstruction of the parking lot and limited parking available. A few years prior ghost glacier (a smaller glacier next to Angel glacier), fell off the mountain into the lake, causing a tidal wave that destroyed the trail and parking lot below. Excellent camping in the summer. Cross Country and downhill skiing  in winter. Rent a bike. Plenty of sport shops offer bikes, which are a great way to see the area. Miette Hot Springs, , are an excellent place to go and relax after a day of hiking. There is also a challenging 4 hour hike advertising the best views in the park that starts from the parking lot next to the hot springs. Maligne Canyon, . The river, up near Maligne Lake, flows in a mighty torrent. When it enters Medicine Lake (named in reference to bad medicine) it does so with great volumes. It does not, however, appear to flow out. Indeed, through the summer months Medicine Lake disappears until, in mid autumn all that is left is a thin channel that itself disappears into the shoreline. In Winter, walk on the canyon bottom to see masses of blue ice where waterfalls flow in the summertime! Athabasca Falls - The Athabasca River thunders through a narrow gorge where the walls have been smoothed and potholes are created by the sheer force of the rushing water carrying sand and rock. Parking and restroom facilities. Paved trail and picnic sites available. Mount Robson (The park's namesake peak is the highest in the Canadian Rockies at 3954 metres. Mount Robson Provincial Park is 217,200 hectares of stunning mountains, valleys, and waterways. Forests of spruce, fir, balsam, cedar and alder are home to an abundant array of wildlife including mountain goats, moose, deer, elk, marmot and squirrels and chipmunks. The Rearguard Falls of the Fraser River is the furthest migration point of the Pacific salmon. GyPSy Guide, Take a guided tour in your own car. The GyPSy Guide is a small electronic device that uses GPS technology to automatically trigger commentary about history, geology, directions and quirky Canadian stories, through your car stereo. Most of the hotels in or near Jasper have restaurants that will meet or beat your expectations for dining in a small community. Some are higher-toned than others, but across the board food is generally very good and portions tend to be hearty. In addition to the hotel restaurants, the town has several noteworthy dining spots as well as numerous restaurants catering to the hungry but penny-pinching skiers and other visiting outdoors-folk. Syrah's of Jasper, 606 Patricia St. Fine dining restauarant with great wine selection. Prices are moderately high, but not out of line for the finer restaurants in Jasper. Dead Dog Bar & Grill, a favorite among locals, the $7 burger & fries deal is probably the cheapest meal in town. Happy hour is on Fridays. Located on Connaught Street. Spooners, 610 Patricia St. Juice bar, gourmet coffees, teas, smoothies, homemade desserts and pastries, sandwiches, soups and salads. Something Else, 621 Patricia St. A Greek restaurant that serves up a variety of cuisine, and pizza. North Face Pizza, 618 Connaught Dr. Excellent pizza, great after a day at Marmot Basin! Sorrentino's Bistro Bar, 96 Geike St. Italian restaurant, popular Canadian chain. Sayuri's Japanese Restaurant, 410 Connaught Dr. Japanese cuisine, sushi. Kimchi House, 407 Patricia St, +1 780 852-5022. Korean cuisine. Jasper Brewing Company, 624 Connaught Dr, +1 780 852-4111. Unique in Jasper, beer is brewed on-site. Earls, 600 Patricia St. Western Canadian cuisine. A restaurant and bar in one, this can get fairly packed out. The staff aren't fantastic, but the food more than makes up for the wait to be seated. Buckles Saloon, Maligne Lodge, W end Connaught Dr, +1 780 852-7074. De'd Dog Bar & Grill, Bsmt, 620 Connaught Dr, +1 780 852-9449. Villa Caruso, Corner, Connaught Dr and Hazel Ave, +1 780 852-3920. The 'B' Ale House, 510 Patricia St, +1 780 852-3386. Chateau Jasper, 96 Geikie St, +1 780 852-5644. Nick's Bar, Juniper St between Connaught Dr and Geikie St, +1 780 852-4966. In the summer, there is excellent camping in the campgrounds operated by Parks Canada. Throughout the year, it is possible to stay in private home accommodation - rooms or suites in residents' homes. Prices vary, but standards are high - full details of what is available can be found in the tourist office in town, or at . Hostelling International runs a series of hostels throughout Jasper National Park. Jasper International is the closest to town (7km south-west from Jasper on Whistlers Road, and is open all year), and four Wilderness Hostels which cater more towards trekkers and those people who "enjoy getting in touch with nature." There are numerous motels and inns within the town, as well as in Hinton, just outside the eastern entrance to the park. Austrian Haven B&B Located at 812 Patricia Street, +1 780 852-4259. Owned and run by a very friendly and welcoming Austrian lady. There are only 2 rooms, which are beautifully decorated with the biggest most comfortable beds you will ever sleep in. Both the rooms have excellent views of the mountains around Jasper. Mount Robson Inn 902 Connaught Drive, +1 780 852-3327. A comfortable well equipped two storey motel style inn. All rooms have air conditioning, cable television, and plenty of room. Reasonable prices. Patricia Lake Bungalows, +1 780 852-3560. Chateau Jasper 96 Geikie St, +1 780 852-5644 Offers exceptional accommodations and amenities complemented by a young, personable staff who extend a warm and sincere welcome. Each guest room is retains the charm of the majestic Rockies. A restaurant and conference facilities are available on-site. Rates vary with season - late Fall being the lowest and Summer being the highest $100-$300. Mount Robson Inn, 902 Connaught Drive, +1 780 852-3327. Offers 80 luxurious, well appointed rooms and suites. $94-325. Jasper Inn Alpine Resort, 98 Geikie Street, +1 780 852-4461. Cozy and tastefully appointed fireside accommodation, comfortable amenities and casual fine dining amid the rugged beauty of the Canadian Rockies. $93-413. Lobstick Lodge, 94 Geikie Street, A favourite among the skiing crowd, Lobstick Lodge features a restaurant onsite, as well as FIVE hot tubs and an indoor pool. Rates: varies with season; Fall has the cheapest rates (<$100 is common), while summer is high season (June - August). Fairmont Jasper Park Lodge, Old Lodge Rd (turn south off highway 16 just east of the townsite, and make a quick right after crossing the river), +1 780 852-3301 or 800-257-7544 ([email protected], fax 780-852-5107), . The Jasper Park Lodge is the premier hotel in Jasper, and one of the most famous and storied mountain resorts in the Canada. Started as a tenting site in conjunction with the Grand Trunk Railway in 1915, it has grown into a renowned destination resort. $400 and up. Bears looking for food are a potential problem. 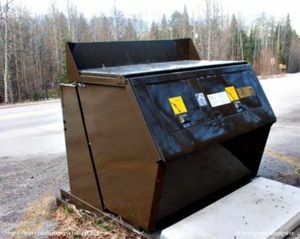 The city has installed bear proof garbage cans and business use bear proof dumpsters. 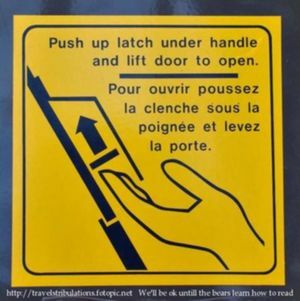 It is a good solution until the bears learn how to read! VIA Rail  runs routes through Jasper, which you can often include as a free stop-over if heading between Vancouver and Edmonton. It is also popular to travel down to Lake Louise and Banff, making stops at Athabasca Falls, Peyto Lake, Crowfoot Glacier, and Bow Lake. This page was last edited on 10 September 2017, at 00:28.